Depression can’t keep an intrepid sleuth from solving crimes. Molly Murphy Sullivan has had a hard year in 1906, barely surviving the big earthquake in San Francisco (Time of Fog and Fire, 2016, etc. ), where she was spending time with her husband, a New York City cop on assignment for the U.S. Secret Service. Back in New York with Daniel and their son, Liam, she suffers a miscarriage and finds out that their beloved ward, Bridie, may be forced to return to Ireland. A last-minute invitation to join her mother-in-law at Greenbriars, a grand mansion on the Hudson where Mrs. Sullivan is visiting friends for Christmas, plunges Molly into a mystery that may just cure what ails her. Despite the festive preparations, all is not well at Greenbriars, where Winnie Van Aiken is unhappy with her stern father and her bossy husband, Cedric. Years ago, Winnie’s young daughter vanished from their home at Christmastime and was never found. A knock on the door on Christmas Eve reveals a young girl claiming to be the missing Charlotte. Winnie is thrilled, but Cedric, suspecting the girl is an imposter, asks Daniel to investigate. 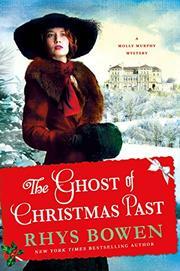 If Molly can’t figure out what happened in the past, a Christmas tragedy may strike again. A difficult case that evokes old-time Christmas traditions and a solution that will warm the heart.